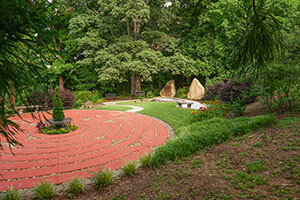 The Columbarium is on the grounds of the Memorial Garden. BIOGRAPHIES of those in the scatter garden. 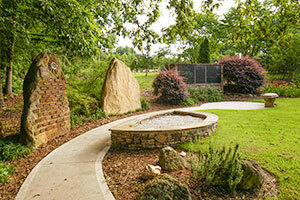 In 2009, a Columbarium was constructed so that people can have a private niche for the inurement of cremains. Once a niche is purchased, it belongs to the owner and as it is used, the door will be engraved with the name and dates of those inured there. There is room for more than one urn. And the space can serve as a family vault. Advance sales of the columbarium niches have paid for the entire structure. No GUUF money has been spent on this construction. 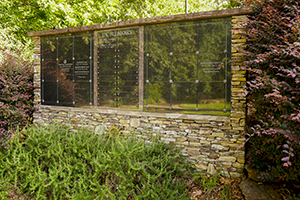 Our columbarium consists of two nine niche units on either side of a Memorial Plaque area. From the time we opened the scatter garden we have wanted some way to remember those special members who are gone but not in our garden. The memorial plaque area is to serve that purpose. If you have any questions or want an application to purchase a niche, ask one of the Memorial Garden Committee members: Bill Schulze, Jim Yockey or Janet Aguilar.